NOTE: Off season mid week specials. Staying 3 nights or more midweek? Inquire about specials. Just two guests? Staying 4 or more nights, just ask. Custom luxury log home nestled in a National Park-like setting. Perched on top of a mountain ridge, the home has long range views to enjoy from the spacious decks. Private setting is a short walk down to our pristine trout stream. Gated community with few homes, so walking is perfect for watching wildlife. Six miles to the quaint village of Hot Springs and the infamous natural mineral springs for soaking in along Spring Creek and the French Broad River. The Appalachian Trail goes through Hot Springs and the ridgeline of the AT is part of the view from the home. Come and visit the Blue Ridge Mountains at their finest; turkey, bear, bobcat, deer, raccoon, hawks, eagles, and owls share the neighborhood. The area is famous for its hiking and water sports. Relax, enjoy nature, breathe the fresh air, sit by the mtn. stream, hike through the National Forest, fish the stream, raft the French Broad River, and rejuvenate in the mountains. Hot Springs Area: Appalachian Trail, French Broad River, Blue Ridge Mountains, Natural hot springs at the Hot Springs Spa for soaking in the out of doors, Big Laurel River trout stream just down from our cabin, fishing, rafting, kayaking, canoeing, hiking, Max Patch on the AT, organic food tailgate markets, Appalachian arts and crafts, authentic Bluegrass music and music festivals, authentic Appalachia. Bear River Lodge: Gated community with over a mile of private mountain stream. Rustic 'Lodge' clubhouse on the river with rocking chairs and firepit. Asheville: The Biltmore House, the Blue Ridge Parkway, nightly music venues, scrumptious dining in locally owned restaurants, trails, waterfalls, and too much to mention. Our Home: Custom 2400 sq. ft. log home nestled in an awe inspiring park like setting. King-sized bed in the master suite with a soaking tub built for 2. Queen beds in bedrooms 2 and 3. Extremely comfortable queen sized futon in the media room. Two twin self inflating air mattresses available for additional guests. Comfortable sofa in loft sleeps 1. Living room has 'lodge' decor, stone 'woodstove' fireplace, vaulted craftsman style ceilings, leather furniture and huge windows for bringing the mountains 'in'. Fully appointed kitchen with granite countertops, Jennair downdraft cooktop, microwave, dishwasher, refrigerator/freezer, and wall oven. Media room has flat screen TV with satellite dish, wet bar, private bath, and porch. Hardwood and ceramic tile floors throughout. Gas grill on spacious deck with furniture for outdoor dining. Wi-fi internet. Bear River Lodge: Home is a short stroll to our beautiful trout stream, which flows for over a mile through the neighborhood. Take a stroll along the stream and enjoy the beauty and sounds of the stream. The neighborhood is sparsely populated so feel free to hike or ride bikes 5 miles to the top of the development and enjoy the nature of the surroundings. If you hike quietly you are likely to see deer, turkey, racoons and even a bear or bobcat. I'm a real estate agent so if you come and fall in love I can help you find the perfect spot in the mountains too. Our home has soaring ceilings, beautiful wood throughout, ample windows for bringing the outdoors in, and is a comfortably appointed spacious log home. Well appointed with soap, shampoo, hair conditioner and lotion. Take your breath away views from almost every window in the home. This home feels like a tree house with almost 360 views. Just you and Pisgah National Forest. Miles of views of wilderness forests from the home. The Big Laurel trout stream is just down the hill from the home. Photos of the mountains never do them justice....come and see how awesome they are for yourself. No code to get on. Please read directions in booklet on island. Take care with the cooktop, it is glass. Fully appointed kitchen with everything but the groceries. Paper towels, napkins, and plastic wrap. Plenty of cooking utensils, dishes, pot and pans, etc. The table seats 8 and the bar seats 3. There are 3 steps to access the main level which has the kitchen, great room, dining and master suite. Home has not been 'baby proofed', stairs are open, decks and windows are high above ground level. Parents are responsible to enquire and inspect for potential hazards. Master on main with only a few stairs; suitable for guests who have limited mobility, but not wheelchair accessible. What a beautiful house! Deb was so pleasant to work with and very quick to respond to emails. The house is very well stocked with everything you would need. We only stayed a couple of nights, wish it were longer. Amazing and beautiful cabin! Home had everything we needed. Beautiful, luxury home, tucked away on the side of a mountain. 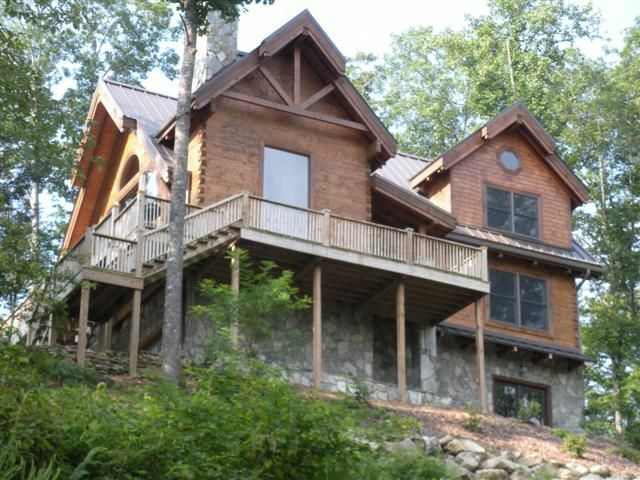 Wonderful home to relax and enjoy nature, hiking, fishing or close enough to Asheville and other attractions if hustle and bustle is more your style. Beautiful home and surroundings and Deb was awesome at communicating and providing information. Highly recommend! Great house, beautiful location and excellent service from the owner! We rented this home for a family vacation of 3 generations around the holidays. The house is awesome and everything was perfect. Great, quiet spot with beautiful views. Nice area just to walk around and enjoy nature, and close to hiking, skiing, Asheville and more. Deb was a pleasure to work with. I would definitely recommend this place! This is an amazing cabin just as described. Inspiring views from every angle. Our family met to share christmas in mountains. We weren't sure what to expect, but we were not disappointed. Fireplace was well stocked with firewood and easy starters and created just the right ambiance. The kitchen was very well stocked and we had ample pots and pans for cooking large christmas dinner. Deb was SO helpful with questions and directions. The dining table well suited for our games and fun. The stream could be heard from the balconies and easy to reach to fish. We would highly recommend this wonderful property. Appalachian Trail, French Broad River, Blue Ridge Mountains, Natural hot springs for soaking in the out of doors, Big Laurel River trout stream, fishing, rafting, kayaking, canoeing, hiking, Max Patch on the AT, organic food tailgate markets, Appalachian arts and crafts, authentic Bluegrass music and music fesivals, authentic Appalachia.